The Guinea Alumina Corporation (GAC) bauxite mine project in the Boké region of Guinea (Africa) recently achieved a major construction milestone when the project team safely set the car dumper facility’s 450 t rotating assembly into its final location. It took three days, multiple self-propelled modular transporters and two 750 t cranes to complete the milestone. 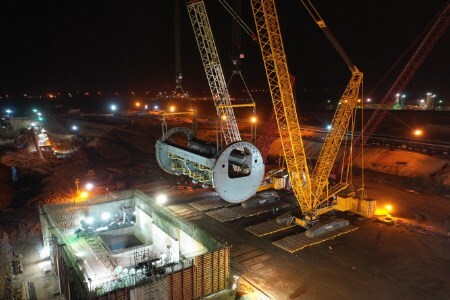 The final lift required special preparations in order to hoist the 450 t assembly over the car dumper facility’s walls and into its final location. A 200 person team, representing 14 different countries and contractors, completed the lift. The project has worked more than 8 million consecutive hours without a lost-time incident. The project is expected to complete in 2019.